Take your break to the next level! 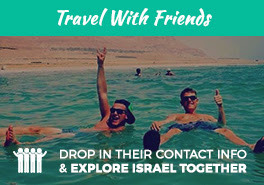 Now is your time to explore Israel on the trip of a lifetime. Get the most out of your 10 days by traveling with Israelis your own age & other students from Bradley University for the whole experience. Fly out of Chicago & get excited to discover the land, history, culture, food, scenes, sites, cities, & so much more on this experience with Shorashim! "The best way to describe my experience is that it truly was the time of my life. It had exceeded all my expectations & more."